Use Red Jasper as a protection and empowerment stone. A very good crystal for grounding. Red Jasper is a power crystal for men who struggle to make their mark in the competitive world. 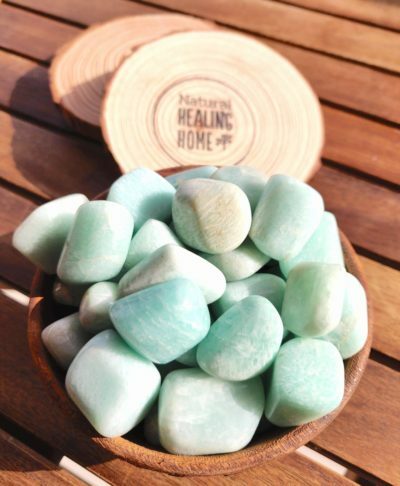 Also helpful for single parents as it a very good stone for grounding stone. Also aids protection against accidents and road rage. Colors: Red to terracotta red-brown color. Some may have black steaks from the minerals present. Physical benefits: Known to help with anaemia, blood circulation, blood cells and toxicity, menstruation, safe childbirth, reduce labor pains, arthritis, rheumatism, heart conditions, and exhaustion. Emotional benefits: Helps men and women to stand up against domestic violence. Emotional stability for a long term illness in remission. At the workplace: Power stone to increase respect and confidence in a new job. Best for: Grounding. Power crystal for confronting situations. Medium to large size. Sizes vary for every tumble as it is a natural product. Red to terracotta red-brown color. Silicate, microcrystalline quartz, here with a high iron content that makes it red.